Disclaimer: I want to point out before we get started that questions like this one are not worth any more than any other question on the test, despite being an order of magnitude more difficult. Getting this question right is only worth your time if you've been perfect on numbers 1-18. Otherwise, even if you get this right, all you will have accomplished is earning back points you lost on a much easier problem. Capiche? 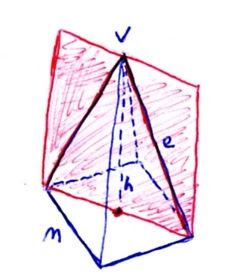 The red point in the middle is where h hits the floor of our pyramid. 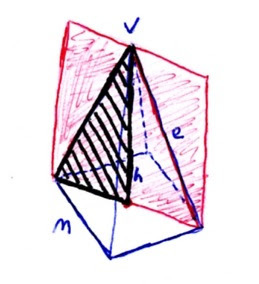 Because this is a regular pyramid, it falls right in the center of the square. 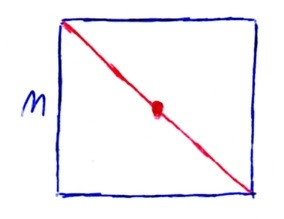 Notice what we have here: two 45°-45°-90° triangles, with the red line as the hypotenuse. 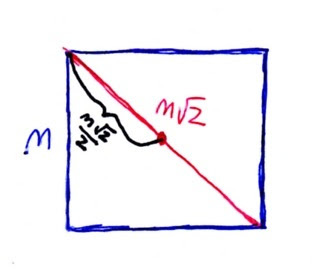 Each leg (each side of the square) is m. Using what we know about special triangles (which can be found in the beginning of every math section), we can conclude that the length of the red diagonal is m√2. 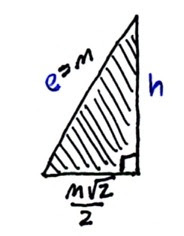 Cut that in half, and you have the distance from the corner to the midpoint: (m√2)/2 (shown in black below). ...time to apply the Pythagorean Theorem. So, our answer is (A). Phew.